Last view: 69 days @Zynk, the throwing sprite is already used from Rock5easily's Rockman 5 YH game so I assume that it's possible to use it. Not sure why it's not used in the final version. The air bubbles? Not sure about that! Last view: 266 days Does anyone know how to make the screen scroll faster in MM4? I tried setting the "vertical screen scroll speed" I got from here http://datacrystal.romhacking.net/wiki/Mega_Man_IV:ROM_map#Misc , but it displaces mega man into the screen. EDIT: Ok, I figured out vertical scrolling, but horizontal scrolling is still eluding me. Last view: 1288 days New Sophia's Rockman 2 Hack called "Rockman 2 Final Mix" isn't released on RDHN. 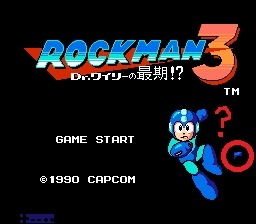 Latest New Hack "Rockman Install Metall" Submitted By Zynk released on RHDN. Disable Select Cursor (Up/Down) in Rockman 3's Title Screen. The Password System is removed. can't disable Up/Down for Select Cursor. Try Insectduel's Rockman 4 Fast Scroll IPS for Mega Man 4. Data Crystal: Low+High and Mega Man's Climb Speed via Hex Editor, not work like Glitch Load Graphics Enemy. Patch IPS (recommended): RM4 Fast Scroll (thanks to Insectduel's Domain from Google Site) works on Mega Man 4 US. New Sophia's Rockman 2 Hack called "Rockman 2 Final Mix" isn't released on RDHN. Can you put the link to the hack here, suppose people here would want to play it? Last view: 1288 days click "ダウンロード" is Japanese Text, Translate English "Download". Apply Patch to JP version Only, NOT US version. Gameplay Rockman 2 Final Mix with No Savestate on Youtube. qzecwx's here or Korxroa's here. Last view: 69 days I'd take that back when I commented that Rockman 2 Final Mix is good. The challenge went way too far on the wily stages something that elitists play. And people claimed that the music is horrible too which I never actually found out myself what's wrong with the audio department. I'd take that back when I commented that Rockman 2 Final Mix is good. The challenge went way too far on the wily stages something that elitists play. And people claimed that the music is horrible too which I never actually found out myself what's wrong with the audio department. I think the big issue with the music is that a lot of it is mediocre and reused, especially in the Wily Stages. The title theme plays for Wily 6, which is fine, but also for part of the ending, and after a while it just gets kinda old. All the later stage themes don't use their triangle waves very well and thus tend to sound kinda empty, as well having kinda similarly sounding instruments. That said, I do think most of the music is fairly decent and just need a bit more touching up.... with the exception of the Robot Master Defeated/Wily Map theme, which is just not very good at all and gets reused way too much. I think the Wily Stages are a bit crazy, but not quite as bad as I originally thought... however, their graphics are kinda boring or mediocre, especially Wily 3. If anything, Final Mix feels kind of unfinished to me. You've got the constant reuse of music, the boss door in Wily 4, etc... at least it tried to be creative, though. Wily 4's ideas were pretty good, even if they weren't handled that well. Looking at Sophia's website, they don't seem very happy with the reaction it's getting. Well, I can understand that. Maybe they'll make an upgraded version, haha! Last view: 201 days No wonder the music is not as good as it should be. The songs are too long and Sophia ran out of free space (checked the ROM...), thus it was necessary to get rid of the triangles in some themes or modify them (But Wily 1-2 and 3-4 are still not as bad as the RM stage themes, and they're from a great game.) MMR had music channel issues once too, because of the lack of space, so I know what it feels like when you cannot include the theme correctly. About the levels. They are challenging. I like the Wily levels (with the exception of some graphics), I like the ideas, "Joe Higashi" for example. It's something that none of other hacks had before. And something I don't like. Crash Bomb. It's too OP. Last view: 114 days Actually I don't play RM 2 Final Mix yet. But what I saw from YT, it such an interesting game. But, later I really occupied by reading comments on qz's video rather than seeing what's going on in the playthrough. Seems almost none of people gave the positive respond to his hack and most of them was complaining about the music. Well, I agree with NARFNra about reusing the song again and again. Then Zieldak provided the good reason why. But besides that, What I saw on YT that most people don't like the way Sophia created the music. I understand that the most of it sounds like what's in GX, and some of them are really good and decent. So the music part was not really a big deal IMO even there are some really high octaves but it's fine, I just turn the volume down a bit. Everyone has his own way to create the music and I really appreciated it (none of them are really bad though). About challenge in Wily 2, well, it's a bit annoying because it's too much repetitive and some of the challenge was too linear a bit, but still okay. The graphics is fine but not so great if compared by other good RM2 hacks like Gray Zone, but at least the 'Pepsi' thing make me smile though. Then at least it was still -much- better than my MM2 Java Island crap, And Sophia really has some good ideas too, I'm still impressed with RM 2 FM, especially the font shading, it's awesome. So Sophia just needs to improve his project later and not wasting his time to see the not-worth-seeing comments on YT which most are just bashing and demotivating without giving a reason why. Last view: 266 days Well, if anything, it's always impressive when someone manages to finish a hack, so that's pretty cool. I think it might have been a better trade off to make some of the songs shorter in exchange for that triangle wave, though... The hack is not super amazing or anything, but it's certainly not terrible, and the ideas are definitely cool. Just could be handled better, I think. I think reusing that song wouldn't be too much of an issue if it'd been a bit less of an odd choice. Maybe he should have only had one robot master theme instead? I think I might ask Sophia if they'd be ok with me seeing if I can do something with the music. Well, if anything, it's always impressive when someone manages to finish a hack, so that's pretty cool. How many rooms can be used/How long can be Wily 1, Wily 4 and Wily 6 in MM3? I don't really want to mess up anything in case exceed the room limits somehow. Last view: 69 days Wily 6 is okay to edit because some hacks had Wily 6 for larger screens and anything before Room 1F has no effect. And many other things. Thanks. Last view: 1288 days Change Palette Color Intro Fade Text 1988 Capcom (JP version) or Licensed by Nintendo (US version) in Mega Man 2? search hex "30 0F 0F 0F" and can't change palette color text in Capcom/Licensed by Nintendo Screen. Last view: 654 days Does anyone know Megaman Odyssey's status? Is it cancelled or not? Because I saw Korxroa playing Demo 4 of it. Last view: 2 hours not very good. Still not done after 2 years. I lost almost 3/4th's of an entire year (2014) to "twitch plays pokemon" which i got extremely addicted to. That's sad to hear. D: But is it still WIP? Last view: 201 days I'm seeking help once again. In MM3, the Giant Snake's eye moves with the "wavy thing" instead of the last Giant Snake (body) (ID66) block. What may be the cause of this? EDIT: Well, I actually swapped the enemy IDs and positions in the ROM manually with a HEX editor, and it works. Weird. Just want to point out that Protoman has underwear on his running sprite LOL. I would really want to fix that & also give his scarf the yellow color. SO I just discovered a way to fix the player sprite's mirroring issue in Megaman 3 for my Roll-chan 3 hack, thanks to Matrixz's notes found here. Also doing Roll-chan 5 & Roll-chan 6 atm. Having trouble with Roll in POW & JET armor with Tango transforming to armor all that jazz. Need those colored green like Tango. I would like some help in locating where the offsets of the player palettes in Megaman 6 esp. weapons & Rush armor colors. MySQL - queries: 126, rows: 167/0, time: 0.141 seconds.